Our family of large containers are the package of choice for transporting, storing, and processing hazardous materials for PG II and PG III products. Durable stainless steel construction allows our containers to maintain product integrity and promote handling safety. 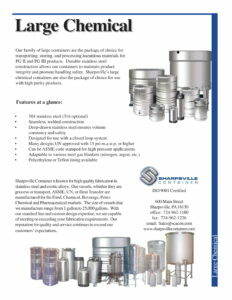 Sharpsville’s large chemical containers are also the package of choice for use with high purity products. Sharpsville Container is renowned for producing high-quality vessels made of stainless steel and other exotic alloys. We fabricate a variety of vessels such as process tanks, transport vessels, ASME certified containers, UN transport vessels, and more for a variety of industries such as chemical, beverage, pharmaceutical, and more. With the capability to produce standard or custom-designed vessels up to 25,000 gallons in capacity, we can fabricate the perfect tank for your needs.